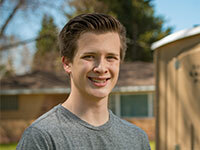 Trevor Trouchon was named the WES Student of the Year. University of Wyoming senior Trevor Trouchon was named the Wyoming Engineering Society (WES) Student Engineer of the Year. He received the honor at the WES awards banquet Feb. 7. Each year, departments in the College of Engineering and Applied Science at the University of Wyoming nominate their top graduating senior for the WES Student Engineer of the Year honor. The WES Scholarships and Awards Committee reviewed written nomination forms and interviewed each candidate as part of the selection process. Trouchon hails from Gillette, Wyo., and studies computer engineering at UW. Read more about him.